Spicy beef. Hearty beans. Shredded cheese. Lettuce, tomato and a dollop of sour cream atop a crispy tortilla. All that—in one Healthy Living recipe. Place tortillas in single layer on baking sheet; spray with cooking spray. Sprinkle evenly with 1 tsp. chili powder. Bake 7 to 8 min. or until crisp. Meanwhile, brown meat in large skillet. Add beans, salsa and remaining chili powder; cook 4 min. or until heated through, stirring occasionally. Remove from heat. Stir in half the cheese. 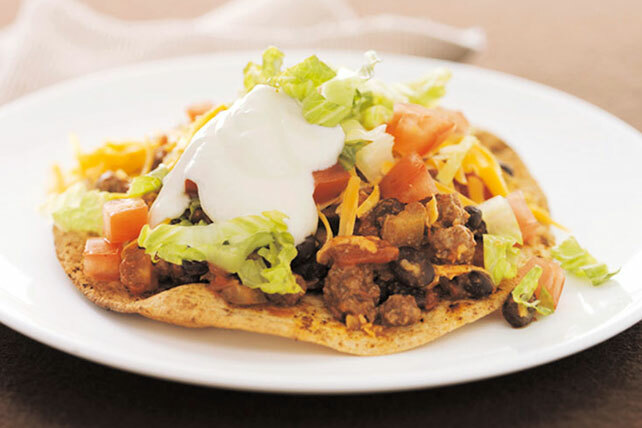 Spread meat mixture onto tortillas; top with remaining cheese, lettuce, tomatoes and sour cream. Using extra-lean ground beef eliminates the draining step of the cooked meat.